Citing people familiar with the matter, Bloomberg reports the South Korean tech giant is working on two foldable smartphone models -- a clamshell design and a foldout device that operates in a manner similar to the Huawei Mate X. The company's $1,980 Galaxy Fold features a bi-fold design that opens vertically like a book. Huawei's Mate X, on the other hand, keeps the entirety of its flexible OLED panel on the device's exterior and unfolds in a manner more akin to a newspaper. Samsung is fine tuning the vertically folding model ahead of an unveiling in late 2019 or early 2020, sources said. 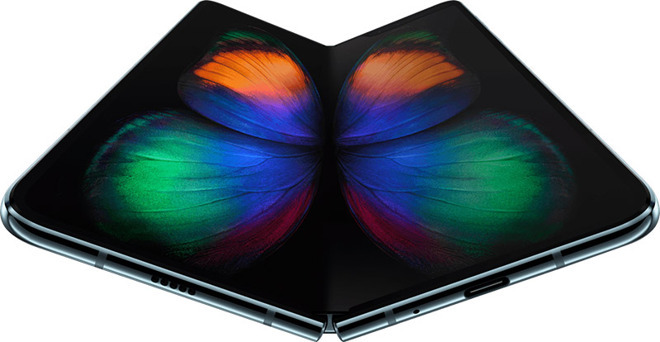 Currently, the device sports an exterior display similar to the Galaxy Fold, though that component might be removed depending on customer response. The Mate X-esque model is also in the prototyping phase and is rumored to be thinner than the Fold as it lacks an exterior screen. Both devices could get ultrasonic fingerprint sensors, a technology debuted with the Galaxy S10. As for the already announced Galaxy Fold, Samsung is reportedly investigating methods to avoid a screen creasing issue that appears on a protective film covering the touch sensor after the device is folded about 10,000 times. The company is mulling free screen replacements, though the sales strategy is not finalized, the report said. Folding smartphones with bendable screens like the Galaxy Fold and Mate X, as well as upcoming efforts from Motorola and Xiaomi, have sparked consumer interest as a promising new portable form factor. It is unclear whether the hype will translate into sales. "No one knows what the ideal design is yet," said Bryan Ma, IDC's vice president of devices research. "The time is ripe for experimentation. Many of these designs won't be successful, but industry players will learn valuable lessons along the way." It appears Samsung is willing to risk research and development capital in a bid to beat market competitors -- not the least of which Apple -- to claim a seat at the head of the foldable phone table. How large that table will be remains to be seen; it could be Samsung sitting alone with a cache of unsold devices. Apple, as usual, is taking a wait and see approach. Evidence of the iPhone maker's interest in foldable portable devices dates back to at least 2015, with related patent filings coming to light as recently as last week. Apple's continued investigation into foldable technology does not, however, signal intent to bring a device to market. Amazing! Anticipating issues in a device yet to ship and working on a strategy to address them after the complaints come in! Only Samsung!! Why not fix the issue before it ships? IOW, "we are not sure what Apple is going to settle on". The Galaxy Fold is the first phone I want that isn't an iPhone. Due to Apple's lack of a new mac pro which is causing me to switch to PC, Samsung is giving me a good reason to upgrade from my iPhone. What would that “good” reason be? Strange that you gave a reason for the computer switch, but didn’t articulate the reason behind your $2000 bag of trade-offs. Without an Apple product to copy they are discovering the pitfalls of trying to innovate. Sounds like exactly what one would expect with a new technology combined with a company rushing to be first. Also why I don’t care to be an early adopter. Just like with other areas, I’d rather Apple be good than be first. I just don't see the use case for this. It's a mildly interesting gimmick, like the Touch Bar, but not particularly useful. I don't think a whole lot of the Fold as it currently is, but Samsung got an early lead with the large screen devices and Apple were definitely late to that party. I hope they're taking this potential new direction more seriously than the sneerers. I have no idea whether or not I want one, but I can definitely see the appeal. It's either a thick but phone-sized device that can become an iPad Mini-sized device when I want a larger screen, or an iPad Mini-sized device I can fold in half to make it fit in my pocket. Rather than owning and transporting two devices, I can consolidate them into one. Some people will undoubtedly still prefer two optimized devices over a single compromised one, but I'm sure many more will accept the prospect of a thicker phone if it allows the screen size to double on demand. I’ve had both...PC’s better. Let me guess, I’m lying? I’ve never had Mac? Let’s see what kind of rubbish you will come up with to make non-Apple device users seem inferior. I’ve had both as well, and I don’t believe Windows machines are better for a moment. However that could be considered subjective. But Macs also have a lower TCO due to being better, and that is not subjective, it’s actual fact. You Go, Samsung. Might as well go all the way and make a foldable 90-inch TV! You gotta give Samsung credit. They made people believe curved displays are beneficial.